It’s Pancake Day, whoop whoop! I get a pancake, you get a pancake, everyone gets a pancake! Haha. I love being innovative and experimental with food. Coming across the Japanese styled pancakes, I knew I had to give them a try. Not only that, but be creative with it. They are no flat pancakes, they triple in size and are oh so fluffy. Why have one when you can have three…in one. Feeding two (depending on how greedy fluffy you’d like to get) with 30minutes making time, this recipe if for Chocolate and Blueberry stuffed Japanese Pancake. In a blender, add milk, eggs, vanilla, sugar, salt and ground spice; blend until mixture is smooth. After which, add flour, ground almond, baking soda. Blend once again, until the latter ingredients are well incorporated and form a smooth batter. Oil ring moulds. Also add a tablespoon of oil to a pan and heat on medium to low heat. Place your moulds on the pan and fill it half way with the pancake batter. Place some blueberries and chocolate cookies in it; add some more pancake batter to cover the stuffing. Don’t overfill the mould, as it will rise. Place a lid on the pan and allow cooking for about five minutes – till bubbles begin to form on the surface. Using a spatula, flip onto the other side and allow to cook for a further five minutes, or until it turns golden brown. When ready, carefully detach mould from pancake on a plate. Repeat the whole process as necessary. 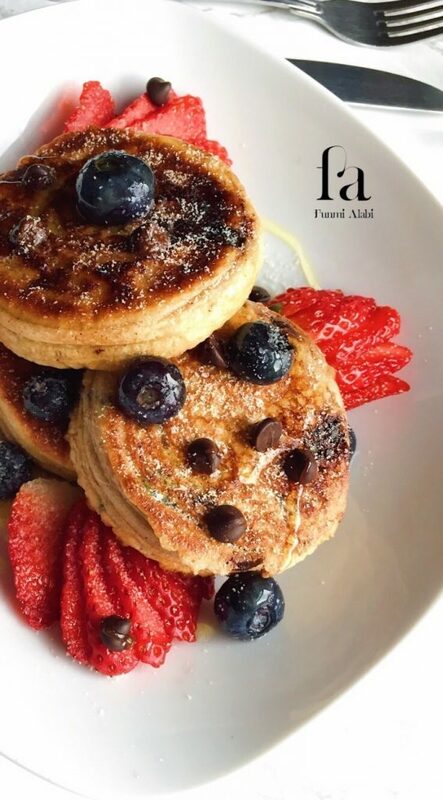 Serve with additional blueberries, chocolate chips and some strawberries with maple syrup. O tanoshimi to yōki ni narimasu! What I love about this recipe is the element of surprise it has to it. The blueberry-chocolate combination is great, as one complements the other beautifully. The pancake also does retain its fluffiness and isn’t overpowered by the stuffing. So here you have it, a Chocolate and Blueberry stuffed Japanese Pancake. I hope these steps are helpful, and the pancake, endearing. If you do try it out, please share it with me, also use the hashtag #FunmiRecipe. Would love to see what you came up with. This looks and sounds so delicious! I’m pinning so I can try it this weekend! This looks amazing for Sundays for a late breakfast! 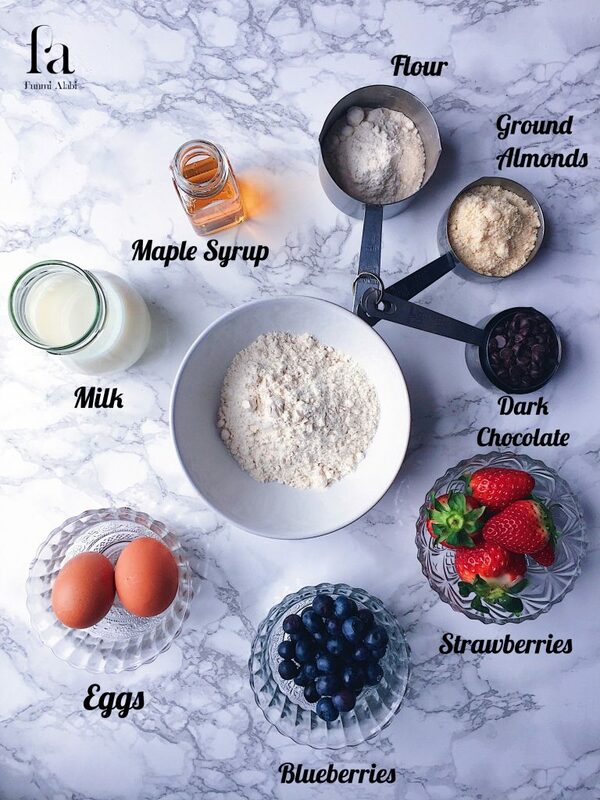 I love pancake recipes, will try this one out soon! Wow, those are some fluffy pancakes! I’ve never had them so thick before. They look great but I’d be worried they would be stodgy in the middle, hmmmm is that a word, I guess not but I’m sure you know what I mean. That being said, you are an AWESOME chef, that’s right, to me you’re a chef O, who should have a cooking channel or open a restaurant! It does looks soooo good! Oh my goodness, these look incredible! I have to give them a go at home! I have always seen Japanese pancake recipes online, but have always been too scared to try them out! Yours turned out absolutely beautifully! I’ll definitely have to try them out now 🙂 Thanks so much for sharing! I wished I could eat them off the picture now?? This actually looks mouth watering – wow! 😛 It’s the thickess! Literally, looks deicious. These look and sound absolutely delicious, I’m going to have to give this a try! I’ve never had Japanese-style pancakes. They triple in size? 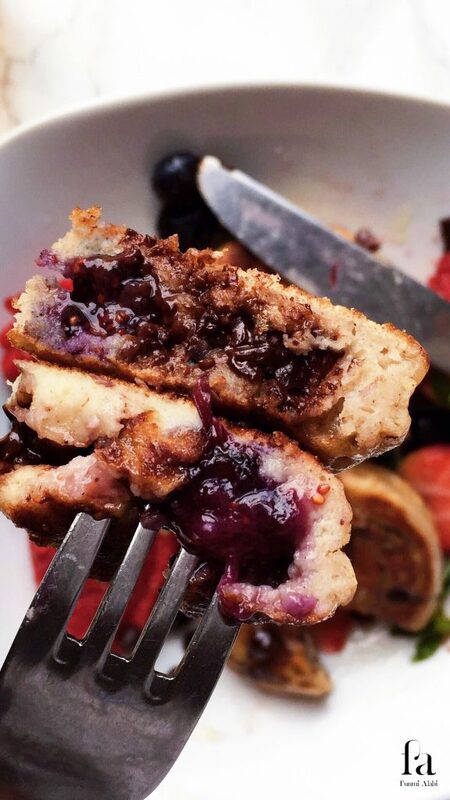 That sounds like my kind of pancakes, and they are stuffed full of blueberry goodness. Great recipe. YUM! This looks like it’s straight out of a magazine. How delicious! This sounds and looks so delightful! I’m planning on cooking the hubby breakfast in bed this weekend so I’ll be pinning this one! Just realized your site isn’t set up to pin? Is there any way around it? Yuuum this actually looks SO delicious!! 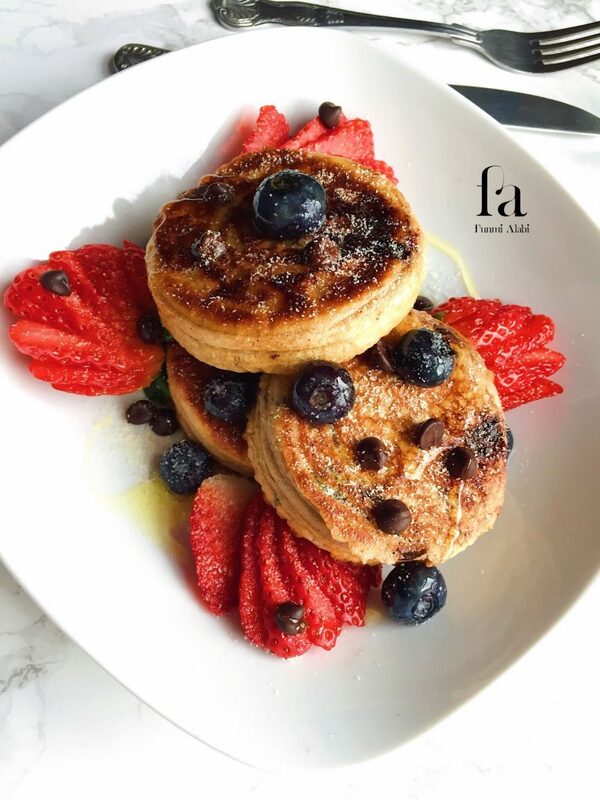 I’ve been based in LA for the last 3 weeks and so totaaaally forgot it was pancake day yesterday, devastated! Amazing recipes! I love this! Great blog post! This recipe seems to be so good, I never heard of Japanese pancakes, but the combination is fantastic – strawberries, chocolate and blueberries! How delicious is that? And, yes, a-hem, it would feed one, me 🙂 I really loved that, I will try! Hope you have a lovely weekend! One delicious looking pancake. Always a fan of a cheat day on which I can enjoy something like this. Holy Moly, these look ridiculously delicious. Thanks for sharing. These look so delicious! I must try this recipe! I need to make this next weekend, it looks so good! Wow! You made me so hunry! 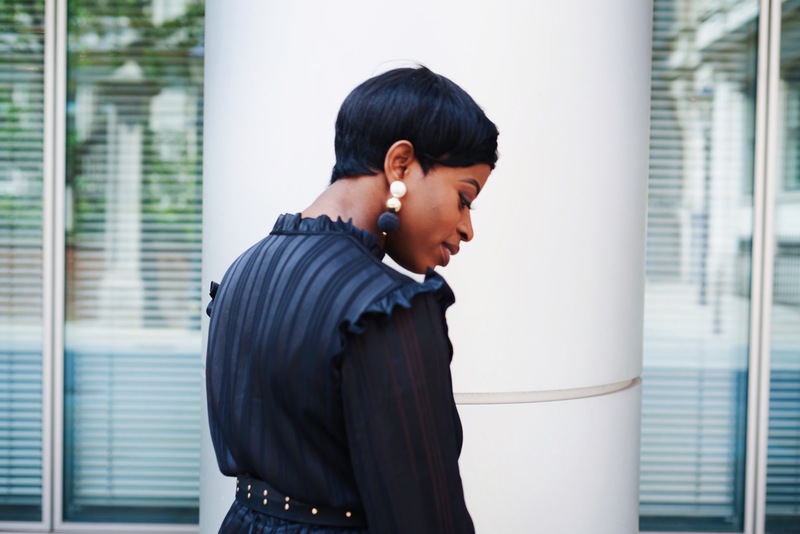 I love your idea od balance, Funmi! Everything in love requires balance, and these pancakes must be prepared! Looks so yum. I have to try this. Thank you for sharing. I’ve never heard of Japanise pancakes before (I only know a cheesecake), but these pancakes look fantastic! The combo of chocolate and blueberries is delightful., while the idea to stuff them gives the pancakes quite spectacular look!